I am now at the stage where both my girls are comfortably in school. They are old enough to do most things on their own, and we can have real conversations. I LOVE this stage. I posted previously about how I feel like I know very little about raising daughters, despite being a daughter myself. Pop over and read that post to hear my struggles from then: Raising Girls – There’s So Much I Don’t Know! Being at school means they are developing habits and routines I don’t necessarily know anything about. Yes, teachers are there to chat with, but I never see them. The girls take the bus to school in the morning, and then go to after school care at the end of the day. That means I rarely interact with any teachers to know what goes on during the day. And frankly that’s how it should be. My girls need independence from me (and their dad) to help them blossom and flourish into well-rounded people. School lunches – they were the bane of my existence for a long time. Now we’re on fairly settled ground, but my girls don’t eat as well as I’d like them to at school. Related: Is It Harder Now To Keep Kids Safe? In my previous Raising Girls post I talked about a few things that were a struggle for me. The number one thing being HAIR. I’m happy to report that our hair brushing (and washing) struggles have settled down. We still only wash hair about once a week (for hair health, but also for lice deterrent!) but we can get hair brushed once or twice a day. And for both girls. Emma has learned to do her own hair, brushing and ponytails, so that is a HUGE help in the mornings. Related: Head Lice – Every Parent’s Nightmare! The other amazing change is bedtimes. Where we used to struggle so much as babies and toddlers, things have really settled down. Sure sometimes the girls fight the idea of going to bed, but it’s never so bad that we have to throw around real discipline. And now they “read” to themselves before going to sleep. I still read bedtime stories most nights (unless extra tv was bargained in place of a story from Mom) but it’s usually fairly short and they’re now happy for me to leave them with a goodnight kiss and a book to look at. If you asked me 2 years ago I would NEVER have guessed that this was coming so soon for me! Do you have kids in the primary school years? Are they easier to deal with now – or harder? 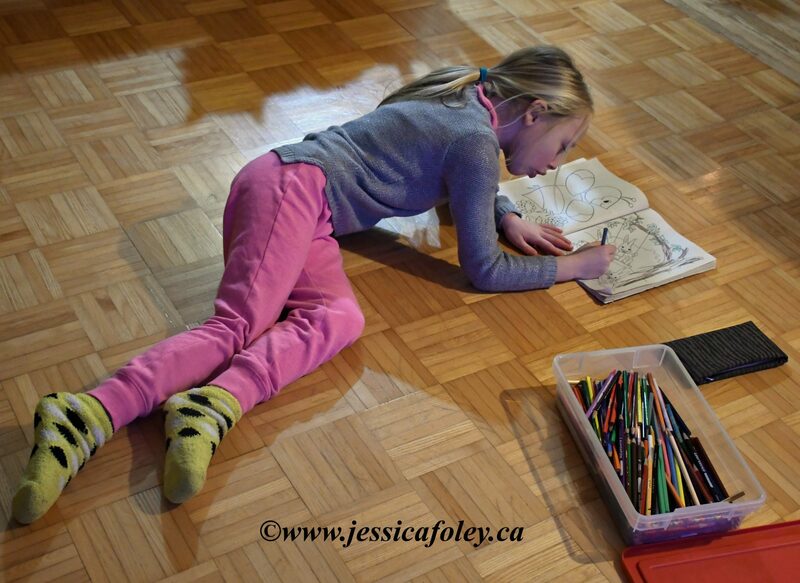 I know the homework business can get quite annoying, but I still am loving this stage of my daughters’ childhoods. I know full well we are quickly heading into the tween and teen years – which bring their own joys and struggles. Leave me some words of wisdom if you’re already there – or share with me what’s happening at whichever stage your children are in. I love connecting with my readers – the more you share, the better I can tailor my posts for you! PS – Don’t forget to join me on this journey called life. You can jump onto my email list here and stay current with me, my daughters, and our busy life! Thanks for the kind words Carol! I hope I am raising my girls to be thoughtful, respectful and independent. It’s so hard to know if what you’re doing now will really make an impact for their future! It’s lovely to see I’m not the only one dealing with primary aged girls. Luckily I have just the one daughter and two sons. My daughter like your daughters, gets the bus to school and theres bullying going on, but not sure what’s what, as like you I only get one side of the story! I love to give my daughter independence but at the same time, I wish I could have her to myself all the time lol. Thanks Nikki! It’s a really tough balance, getting the independence and proper level of parenting in there. And I’m sorry to hear your daughter is seeing (or experiencing) bullying. It’s hard to let them go and experience these things sometimes, isn’t it? I’m sure the teenaged years bring lots of new challenges. I enjoy staying connected to people who are a bit ahead of me in life – gives me places to turn when new things crop up! I also love the “quiet” time when the girls are at school and I get to be at home. It’s rare, but it does happen! I too try to let my kids have the same freedoms I had as a child and it’s so hard. I even took my boys on a driving tour of our town to show them the route I used to walk home from school… when kids were allowed to walk home from school. I was in Kindergarten walking with my 8 year old sister and we were fine because almost EVERYONE walked home from school. I think it’s kind of sad that we rarely see kids outside and never unattended or with an adult close at hand. I’m with you! Walking home from school was the norm when I was growing up. Now it seems that unless you live 3 houses from the school there’s a bus you can take. I don’t like that! I live in hope that I will inspire other parents to let go of their kids and send them outside to play (when they are ready and responsible enough) without parents hovering about. I’m doing it – you can too! Wow – I don’t envy you Jeremy. But you’ve been through it once already, so maybe you’ve learned a few things? I know every kid is different. That’s certainly the case in my house. I wish you luck with all your parenting stages! I only have one daughter (and three sons) but I can relate to so much of your post, especially the hair brushing battles (she has it down to her waist at this stage!). I also enjoy their primary school years, but homework remains a major chore in our household. I have read the book “Raising Girls” by Steve Biddulph – a very interesting read. As I am a mom of two girls – it has really opened my eyes in what happens at each stage of a girls life and how we as parents can help them develop in strong, confident and independent women. Sounds like you are doing a great job Jess! Your girls seem grounded and very independent. I have a 3 yr old and a 7 yr old so we are at different stages here. They need to stop growing up so fast, I know that much! They do grow fast, don’t they Jayne? Thanks for the kind words! My son is 8 now and everything with him is so much easier now he’s more independent. He also loves going to bed with a book to read himself. I feel it does get easier – though soon enough we’ll be moving into Tween and Teen years which have their own struggles! I love letting my kids read before bed It’s always something I’ve enjoyed doing! I agree Heather. I’m hopeful we can shift the tides of parenting and childhood and let our kids get back to the more free and unfettered childhoods we had growing up. I think it’s ridiculous that people thinks kids can’t be alone outside, or go to the (close to home) park by themselves. How else do they grow, learn, and become independent, functioning adults?